My life has been a whirlwind. So much has happened, so I guess I will fill you in on everything! I did make it to Springdale for Brian's visitation. It was good to see Kristina and show her our support. She was surrounded my hundreds of family and friends. She is doing good. Keep her in your prayers as she tries to get back to some normalcy in her life. We have officially sold our home! 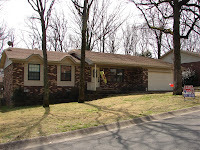 We closed on our house on Friday, March 14th. And on Saturday, March 15th, we had the movers come and move us into our apartment. My sister, Michelle, Betty and I started moving some stuff into the apartment on the Monday before. We were able to move all the stuff in all closets and most all that was left for the movers was the furniture. It actually went really smooth and was worth every penny to have them help. We were all moved except for the kitchen and garage by Saturday night. Sunday we finished up the kitchen and garage and turned over the keys! It was a little sad to say goodbye to our first home. The home we brought both our babies home too. But more excited to know we are one step closer to getting into our new home! 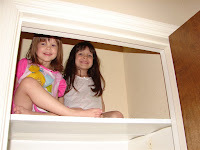 I will leave you with a few more pictures of a fun time before the move...playing in an empty closet. Wow! How EXCITING! 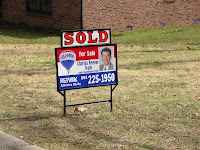 Congrats on selling the house and getting moved successfully! 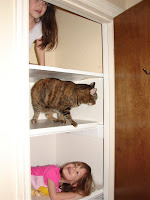 Love the cat in the closet. Typical cat! ha ha,memories. 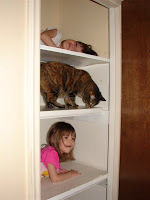 my brother and I used to play in the linen closet all the time. i'd forgotten about that. and I'm with ya... we lived in an apartment when we built our house. man I hated it! But it did make our house feel like Cinderella's palace.